We all love a bargain, so it`s a bonus when one doll suddenly becomes two! It`s a lot more common than you might think – many dolls can be altered in appearance, giving extra play value, as well as novelty interest. Children love it when a sad doll becomes happy, or a doll in tatters is transformed into a princess, and numerous people nowadays are building up collections of `transforming dolls`. There are several ways in which a doll can change its appearance. Probably the most commonly-found are the topsy-turvy dolls, which consist of two half-dolls joined at the waist, sometimes with an extra doll attached at the back for good measure. Other transformable types include two-or-three-faced dolls, dolls with interchangeable heads, and dolls whose expressions change because their rubber faces are moulded over a moveable wire armature. 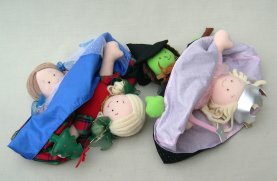 The easiest topsy-turvy dolls to find are those made from cloth. Sometimes they are dolls which tell a story, such as Cinderella in rags turning into the belle of the ball with a flick of her skirts, or maybe Red Riding Hood who changes to grandma. The wolf might be incorporated too, giving even more value. The principle in all these dolls is the same – they wear long skirts and beneath them you`ll find another head and body, rather than a pair of legs. Recently, Jellycat, produced a topsy-turvy Alice in Wonderland doll who changes from Alice into the Queen of Hearts. Jellycat dolls are beautifully and elaborately made, and their other exciting upside-down dolls include the Frog Princess, Nursery Rhymes, Cinderella and the Enchanted Garden. 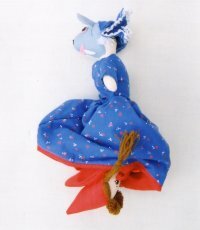 Another maker, the North American Bear company, issue dolls which changed from witches to fairies and from Goldilocks to the Three Bears, amongst other innovative designs, while during the 1980s Peggy Nisbet made porcelain topsy-turvy dolls. One was Cinderella, who turned from rags to riches, the other was `My Fair Lady`, which altered from poor Eliza Doolittle to posh Eliza dressed for Ascot. Souvenir Topsy-turvys often seen, such colourful stockinette dolls from the West Indies, whose costumes change when they are reversed. Another form of costume doll has a moulded felt face with painted side-glance eyes, and turns from a Spanish senorita into a peasant girl. A few years ago, an Australian company called Milly Molly brought out a rag doll which turned from white to black, the idea being to promote racial harmony. Their slogan was ‘We may look different but we feel the same’, and the marketing theme was a ‘reconciliation doll for world peace’ The idea behind these charming dolls wasn`t new; the white to black theme has appeared many times, not just in cloth dolls but those made from other mediums too. 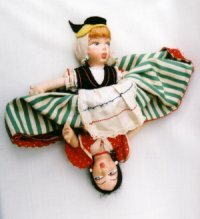 Topsy-turvy dolls can be cloth, composition, plastic, china or celluloid. The American Madame Alexander doll company made a composition doll – a kind of plaster – in the 1930s, which consisted of a pair of dolls joined at the waist, one sprayed black, the other pink. The first had pigtails of black woolly hair, while the other doll`s hair was moulded and painted. These early Madame Alexander dolls change hands for around £150 in good condition. Plastic topsy-turvys i nclude a Roddy from the 1960s, with joined torsos. This was possibly a prototype, as few are around. A simple way of changing a doll`s appearance is to make a cloth doll with two fronts. This method was used for an attractive doll, Bobby Snooks, made by the US company, ToyWorks in the 1980s. On one side he is a smart soldier, but turn him over and he`s tattered and torn after battle, complete with a plaster on his nose. For years, manufacturers have puzzled how to produce dolls which change their expressions. 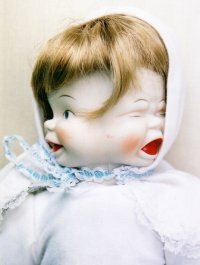 Swivel-heads were often used in antique china dolls; the doll`s head might have two, or even three, faces, and a twist of a knob turned the head to reveal the desired expression. During the 1970s and 80s, this method was revived and a number of `cheap and cheerful` multi-faced bisque china dolls appeared in the shops. These dolls are now becoming sought by collectors, as the early ones are so expensive. 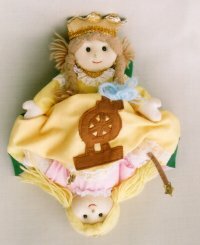 The same technique has been used with plastic dolls. In America, they were particularly popular during the 1950s and 60s, and companies such as Ideal issued a series of them such as a soft-bodied girl with a knob on her head hidden by a bonnet. Her three faces changed from sleep, to smile, to cry. One of the most delightful two-faced dolls of recent times was made by Falca in the 1980s. She was a sturdy, 22 inch baby and her two faces – one happy, one miserable – were beautifully and realistically moulded. In addition, she featured a crying/laughing sound chip which, rather cleverly, would only operate when the correct face was forward! Various companies have made vinyl face-change play dolls from time to time, such as a small, 8 inch, unmarked Hong Kong baby dressed a blue floral hooded suit who featured a large knob on top of his head which, when turned, allowed three expressions. Another doll, `Toni Two`, was sold in packaging which boasted, `Turn my head and I`m mad, turn my head and I`m glad`. Toni Two was a toothy toddler wearing a red striped dress. Doll-designer Marie Osmond has featured two-face dolls in her collector`s range, including Missy, a beautifully-dressed doll in a turquoise gingham frock and mob cap, whose expression can be changed from happy to sad. Another way of changing faces is to model the doll`s head on a wire frame, using thin soft plastic, such as in the case of Mattel`s 1960 `Cheerful Tearful` or their later `Saucy` doll. Cheerful Tearful`s expression changed from a smile to a pout when her arm was raised, and she looked cute. In contrast, Saucy was hilarious. Operated in the same manneA collection of Dressel and Kister shoulder head and half-dollsr, she rolled her eyes, grimaced and made the most awful faces; she must have had a really bad influence on her little owners, because they were sure to have copied her! More recently, Famosa introduced Baby Expressions, a battery-operated face-change doll, available as both boy or girl. Occasionally, dolls are sold with spare heads. 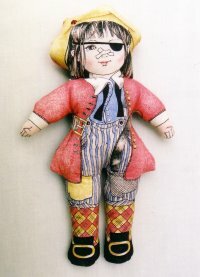 A French doll maker called Le Tort patented the idea in 1849, and it was soon copied. Decades later, a celluloid doll was produced which came with three assorted girl heads, as well as a boy – and a cat! It must have seemed strange having a cat-headed doll. During the 1960s, Teltoy made a teen doll called Brenda with three heads, each with different colour hair. Today, several dolls feature interchangeable wigs; the idea is particularly popular amongst some of the teen dolls made for collectors, allowing the appearance to be slightly altered, even if the expression is not. Dolls with `hair-grow` mechanisms, such a s Tressy, are another example of a doll changing its style to suit the owner`s mood. Perhaps one of the most unusual ways of altering doll`s face can found in Mattel`s `What`s Her Face` dolls, which come with totally blank faces so the owner can design them as she likes. They have spare wigs and funky outfits, and can be given a new persona almost instantly. Yet even that idea isn`t new; folk dolls, especially the straw types, occasionally come with blank faces, while play dolls are sometimes given bland or indistinct features to allow a child to stretch the imagination. Highly collectable Sasha dolls have neutral faces, which can look happy, sad, contented or dreamy according to the mood of the viewer, and so, although not `face-change` dolls as such, they do allow for imaginative interpretation of expression. Next time you see a long-skirted cloth-doll, a doll with a rubbery face, or maybe a doll with a suspicious bulge beneath her bonnet, examine them carefully. They might not be quite what they seem! Buttons The World’s Most Popular Collectible Secret!